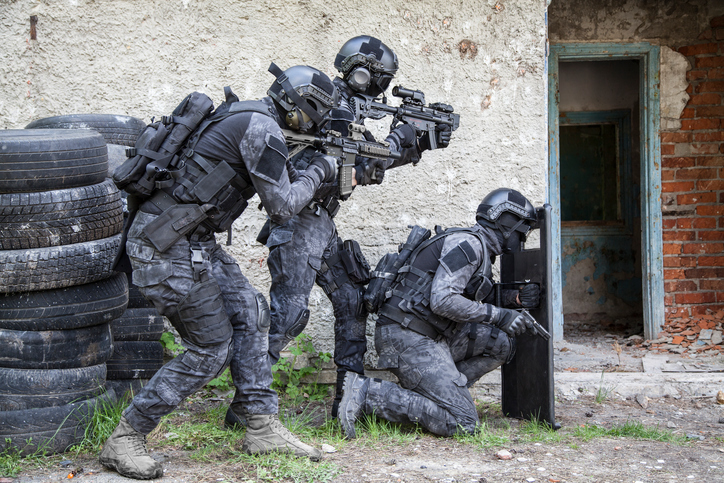 A raid is a sudden attack or assault, or any other act of suddenly entering a place with the purpose of seizing or suppressing something or someone. As a military term, a raid is a sudden attack on enemy forces. In business, a raid is an attempt on the part of speculators to force stock prices down or, in US English, a large-scale effort to lure away a competitor’s employees or members. The verb to raid means ‘to make a raid on,’ ‘to steal from,’ or, in US English, ‘to entice away from another,’ as companies might do. Figuratively and rather informally, raid also means ‘to take something quickly and secretly,’ especially if we are talking about something to eat! The police are planning a raid on the drug dealer's house. The troops carried out a raid. The large multinational made a hostile raid on a smaller company. The firm lost a lot of its top talent to its competitor's raid. The police raided the illegal gambling den. The financial director was fired when it turned out he had been raiding the company bank account. I see Veronica's raided the cookie jar again; there's only one cookie left! air raid: an attack where military aircraft drop bombs. ram raid (mostly UK): a raid where thieves use a vehicle to ram the front of a store, breaking the display windows, and then steal the stock. Raid was originally a Scottish term for a military attack on horseback. Raid, meaning ‘mounted military expedition,’ dates back to the late 14th or early 15th century. It was originally a variation of rade used in Scotland and Northern England. Rade, meaning ‘a riding or journey,’ can be traced back to the Old English rād (‘a riding, expedition or journey,’ or ‘a raid’), a doublet of rād, meaning ‘road.’ It can be traced back to the Proto-Germanic raido and the Proto-Indo-European reidh– (to ride). It is related to the Old Frisian red (ride), the Old Saxon reda, the Middle Dutch rede and the Old High German reita (foray or raid), and the German Rad (wheel), as well as the English word ride. Raid disappeared after Middle English, and was revived in the late 18th century by the Scottish writer Sir Walter Scott, with the extended sense of ‘attack or foray.’ The non-military senses all appeared around the mid- to late 19th century, originally as figurative uses. The verb comes from the noun, and dates back to the late 18th century.